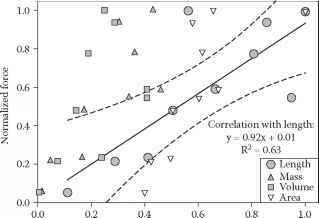 FIGURE 3.7 There was a significant correlation between drag and length (R2 = 0.63), whereas only weak or nonsignificant correlations were found between drag and blade mass, volume, or area. 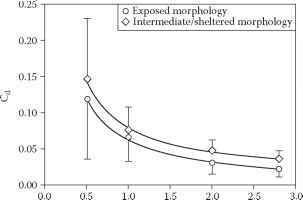 The morphometric parameters and the forces were normalized by the values for the largest individual, which was also the heaviest and most voluminous one of the test sample. The regression is only for the normalized length data, while the dashed lines represent the 95% CI. FIGURE 3.8 Shortening experiment with two individual D. antarctica (specimens VII and IV; Table 3.1) tested at a velocity of 2.0 m s-1. The nonlinear trend between drag and velocity indicates that a simple cut prevents the thallus body from reconfiguring into a more streamlined shape. The parameters are normalized to the maximum forces during the individual test runs and the individual lengths for ease of comparison. Error bars indicate standard deviations of 60 s of data, recorded at 10 Hz (i.e., 600 data points). FIGURE 3.9 The change of the drag coefficient, Cd, with increasing velocity of the fluid (u) for Durvillaea antarctica, grouped by wave-exposed and intermediate/wave-sheltered morphology. Error bars indicate one standard deviation. than would be predicted if the relation between a morphological parameter and drag was linear (see previous paragraph) or squared (Equation 3.1).